Why you shouldn’t waste your time – and speed – writing SEO *rich* snippets. – Get under 2-second load times on shared magnetic hosting with free plugins and themes. We’re keeping this simple. 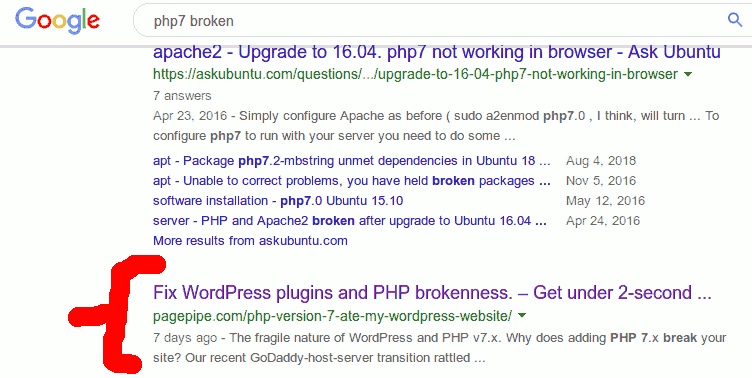 Here are the real comparison of two Google listings of our blog post about PHP 7 and how it affects WordPress speed. Notice the difference in the snippet language. It’s the number one position naturally – because it’s an exact match. But notice the WordPress permalink underneath the link doesn’t match the post title. It gives more information scent for the user about the problem we’re addressing. Your page tile and snippet don’t need to match. It’s better if they don’t. Publish more clues and cues for potential users and improve click-thru. The snippet is selected by Google. It’s based on user search intent. Artificial intelligence drives the choice of snippet using an algorithm called RankBrain. It was introduced on OCTOBER 26TH, 2015. Long ago! You should care about RankBrain because it’s an ever-increasing ranking factor. RankBrain is part of Google’s core algorithm using unsupervised machine learning. Machines teach themselves from data inputs. RankBrain determines the most relevant results to your search engine queries. RankBrain’s used globally by Google. It sees relationships automatically. It makes educated guesses. The guessed answer to a query improves as the computer learns what people are really looking for in searches. It builds a relational database of intent. Search intent, also known as keyword intent, is the ultimate goal of the person using a search engine. Since people look for, process, and use search results differently based on their ultimate goal, understanding and optimizing for search intent is important for Google. By leveraging keyword intent, advertisers not only increase site traffic, but also attract more qualified prospects. This creates more sales and generates more leads. It helps Google sell more ads! Google uses RankBrain to select and construct featured snippet results from your page content – not from your handwritten rich snippet database. That’s right. Shock! Your snippet efforts are a waste of time. Stop writing them. Uninstall your slow-loading SEO plugin. RankBrain does a better job of matching user queries with your web pages. This means you are no longer dependent on having all the keywords from the user query on your page content – or rich snippet. In this case, using the search phrase “PHP7 broken,” our same-post snippet is now pulled from a completely different part of our page. The results are better matched for keyword intent. Even if the keywords weren’t in the search phrase. Google guesses intent. Notice the publication date is “7 days ago.” Fresh as a daisy! Read about how to keep content evergreen here. Stop trying to defeat Google from doing a better job writing snippets. It’s their choice whether to use yours or not. Google has no obligation of compliance with your wishes or SEO manipulations. Google owns the web. They undo your wasteful snippet work in a blink. Don’t try and save your snippets. They’re junk. Don’t install a different SEO plugin in some kind of salvage operation. They’re slow and obsolete. Previous PostPrevious Evergreen Content: Expired dates diminish site credibility. Next PostNext Big speed tips for newbies.